The FBI under J. Edgar Hoover was never as it seemed, and supportive reporters had no qualms changing the narrative to make the bureau look good, the Topeka Capital-Journal reports. Take April 6, 1939, when an inexperienced FBI agent shot and killed a bank robber, Bennie Dickson, under questionable circumstances. The agency changed the details of the case to make the shooting appear to be self-defense, saying Dickson had a gun in his hand, instead of in his waistband. 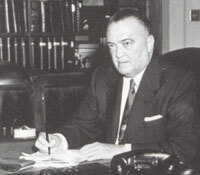 The case is highlighted in “Hoover’s FBI and the Fourth Estate,” a book about the media’s involvement with the FBI. “In the early 1930s during the war on crime, he saw how the exploits of law enforcement created an appealing story for people,” Cecil said. Posted: 4/7/14 at 9:13 AM under News Story.